"John and Horace Dodge started in the automotive industry by supplying engines and transmissions to R.E. Olds, later selling engines, transmissions, and axles to Henry Ford for his automobiles. By 1913 Ford started producing these parts and adapting them to their own machines, leading to the Dodge Brothers producing their own automobile that was high in quality and durability at an affordable price. In 1928, Walter P. Chrysler bought the company after the brothers' deaths. 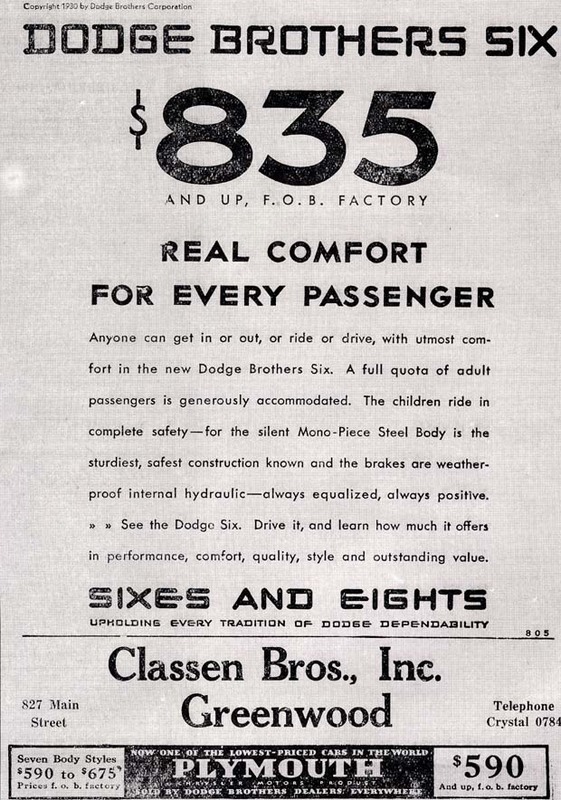 The 1930 Dodge DD Six Business Coupe, advertised by Classen Bros. Inc. of Greenwood, had a factory price of $835. Power was supplied from a 6-cylinder 189.8 cubic-inch engine that provided just over 60 horsepower. Classen Bros., Inc. was located at 827 Main Street in Greenwood, later renumbered as 1099 Main Street. The dealership, which also sold Plymouths as well as Goodyear tires and tubes, was established in 1921." - Text from calendar by Jayne M. D'Donofrio. Photo courtesy of the Wakefield Daily Item. “Classen Bros., Inc., 1930,” NOBLE Digital Heritage, accessed April 22, 2019, https://digitalheritage.noblenet.org/noble/items/show/6836.